We find not one ſincere, if Beauty be away. No Son of his can drink without a Toaſt. That bears not Numbers ſacred to your Praiſe. To teach the dull inſiped Juice to warm. And Wit and Muſick are the lovely Birth. If Beauty did not join to fire the Heart. But the true real Joy we taſte is Love. You, who refine their Pleaſures and their Wit. Wou'd you vouchſafe the ſinking Stage to prop ! Since what was Sung to you cou'd ne'er be Sung in vain.
" ... spoken on Tuesday, January the 4th, 1703". 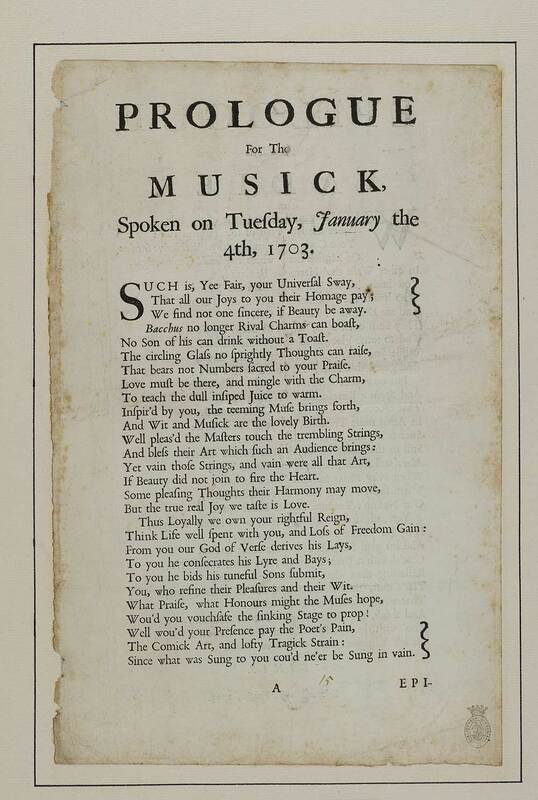 Prologue for the musick - first line reads: Such is, yee fair, your universal sway. 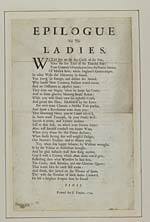 Epilogue to the ladies - first line reads: With joy we see this circle of the fair. In one column.